Ham and sweet potatoes are a common choice for holiday dinners, but who says you can only have this yummy combo once a year? Why not combine them for a casserole that will make your average week night dinner extra special? Sweet potatoes (or yams) are those wonderful spuds that are typically overlooked during the year unless it’s Thanksgiving or Christmas. During the other ten months, when people think of using potatoes as their side dish, they tend to veer toward the white variety for mashed, fries or baked. But a sweet potato actually has more health benefits than its white cousin. The orange tubers are loaded with antioxidants like beta-carotene, vitamin C and pro-vitamin E, which means that eating them could lower the risk of heart disease and cancer. And since they’re so tasty, it’s a nice change of pace from the typical white variety. But if you think the only way to ingest this potato is by baking or mashing it, you’d be wrong. Sure there are the sweet potato fries that seem to be at every restaurant under the sun these days, but they’re just as flavorful chopped up and included in a casserole like this one from The Chew. And if that’s not reason enough to add them to your dinner tonight, that burst of sweetness coupled with some salty melted cheese will being smiles to everyone’s face and turn a typical casserole into something deliciously unexpected. Preheat the oven to 350 degrees F. Grease a 2-quart casserole dish and set aside. Cook the sweet potatoes in a large pot of boiling water until tender, about 20 minutes. Drain and set aside. Melt the butter in a large skillet over medium-high heat. Add the onion and garlic and cook until tender, about four minutes. Add the rosemary and parsley and cook for another minute. Reduce the heat to medium-low and gradually stir in the flour. Add the milk and continue stirring until thick and creamy, about three or four minutes. Stir in the ham and cheese until the cheese is melted. 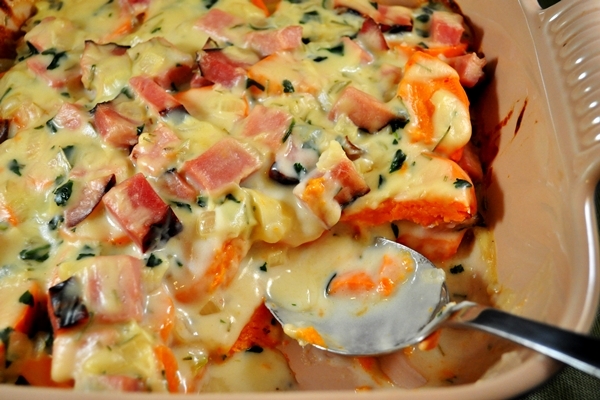 Arrange half the prepared sweet potatoes on the bottom of the prepared casserole dish. Top with half the ham and cheese mixture. Repeat the layers, ending with the ham and cheese. Bake for 25 minutes and serve immediately.